New York City Mayor Bill de Blasio has declared a public health emergency in the Williamsburg neighborhood in Brooklyn. WBGO’s Ang Santos reports, it’s in response to a measles outbreak affecting the Orthodox Jewish community. In response to a measles outbreak affecting the Orthodox Jewish community in the Williamsburg neighborhood in Brooklyn, New York City Mayor Bill de Blasio has declared a public health emergency. All residents in Williamsburg are being ordered to receive a mandatory measles vaccination. New York City Health Department Commissioner Oxiris Barbot says unvaccinated residents could face a fine. “If the department identifies an adult or a child with measles, or an unvaccinated child exposed to measles, the individual or their parent or guardian will get a violation that could be fined $1,000 per instance,” she said. 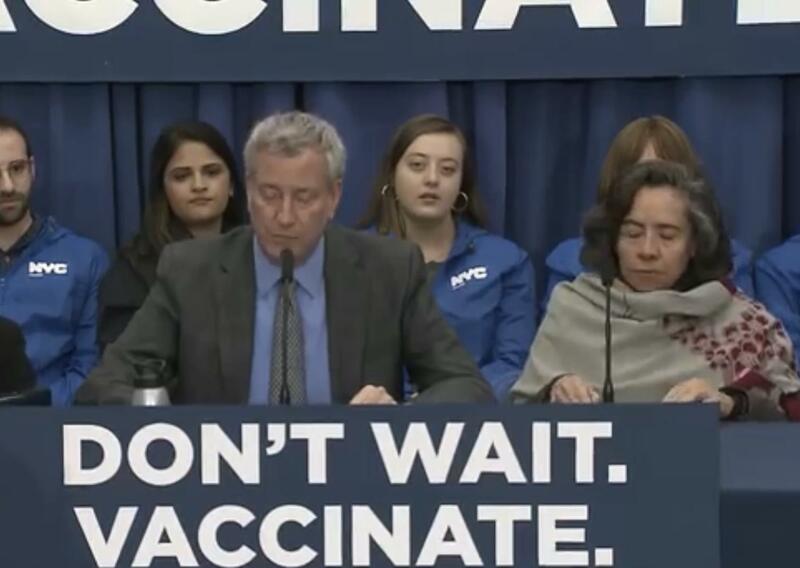 Mayor Bill de Blasio says schools and day cares in the Williamsburg neighborhood are subject to closure if they allow unvaccinated kids into the classroom. “The goal here is to send a message that people need to act immediately to get vaccinated and that vaccination is readily available here and throughout the city,” he said. 285 cases of the measles have been confirmed in New York City since October, a majority of them children under 18 years of age. City health officials say only two were confirmed for the entire calendar year in 2017.